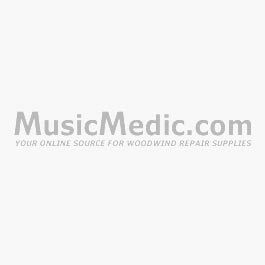 An excellent quality file is a very useful tool in a woodwind or brass repair shop. Both flat and curved files are available in coarse and fine grits. The curved file features a flat side and curved side for reaching areas the flat file cannot. Use these files for making or altering any woodwind key or brass surface. If you find that you need a file for brass and steel, you may want to order two sets rather than using one file for both metals. No shop can be without a set of these excellent Swiss made files.